When run in the Pre BACS mode, the report will produce the year to date totals that will be reported on the FPS for both your active employees and leavers within that tax year. 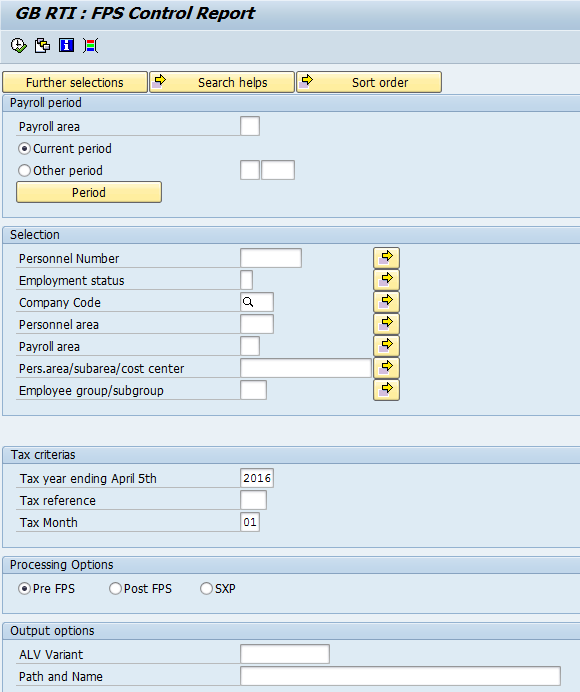 The figures come from the RTI and RTINI tables of the payroll results. You can use the figures reported to reconcile amounts before running an FPS for that pay period. A key point to note, the Pre BACs mode will only report on payroll results that do not have a global ID stamped on them. So once you have run your FPS in live mode, this report will not return any results – which is correct behaviour of course, as the payroll data is no longer ‘pre FPS’. The Post BACs mode will report figures from the latest payroll cluster entries for your employees and so, should, marry up the figures reported on your FPS submission with the figures that HMRC hold. If you chose to run the report using a tax reference as a selection criteria, you will only get accurate results from the report once all FPS submissions have been made for all payroll areas on that tax reference. In the SXP mode, the control report reads and reports the SXP recoverable and non recoverable year to date totals for your SXP amounts. If you do not use the standard SXP wage types, do not forget to configure your own wage types you use in T596i for correct reporting! Guidance for this is available in SAP notes 2143718 and 1851979. The figures produced can then be used for your EPS reporting. This will only be a temporary measure though, as EPS enhancements are due with the start of the next tax year updates that will auto fill the SXP values on your EPS. If you have been looking towards the new Payroll Control Centre and declustered your payroll results storage, you can still benefit from using this report. When your Payroll has been declustered, SAP stores payroll results in both the declustered tables and also the original payroll clusters. So you can use this report however you have your configured your payroll results storage! 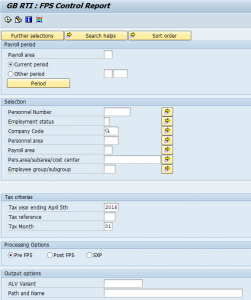 Transfers across tax reference will show the relevant totals under each tax reference. If your payroll areas are under the same tax reference, then you can run the report using the tax reference as the selection criteria – just a point to note in case it looks like your data is reporting incorrectly. Also, if you are using the FPS BADI in your RTI reporting, the modified data will be reported on the control report. The report is to be found in SAP note 2143718 and 2143719 UDO, or in support packages C6 for 600 releases, 92 for 604 released or 20 for 608 released. It is really useful to have more reports that support you to check and validate the data that you are reporting to HMRC, and for you and your company to have absolute confidence in your submissions to HMRC.